Lightweight, quick drying popper fastening, these adjust snugly to fit any size baby securely enough to contain major accidents so you can get out of the water quickly and change your baby, without contaminating the pool. 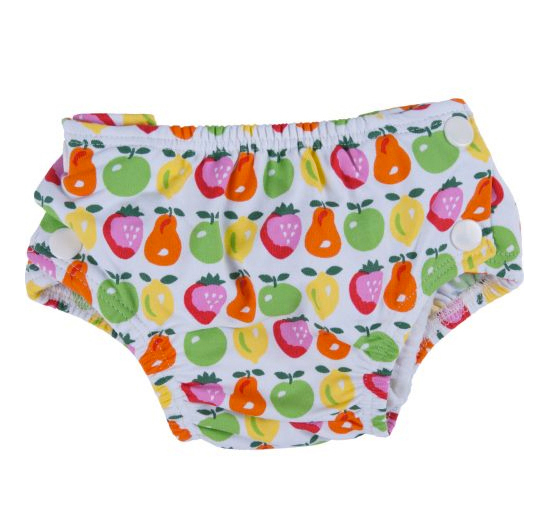 Funky designs make these swim nappies the talk of the pool - with the adjustable snap closure at both sides, sewn in security mesh inside to help contain any little accidents, and of course they are totally washable. Its soft and efficient elasticated legs and side snap popper fastenings make for easy changing. Rinse nappy in fresh water after use, machine washable. An economical solution that is best for the environment. The skin is our body’s largest organ, and a baby’s skin is especially sensitive. Popolini's range of infant clothing only use the finest organic cotton and wool/silk of eco-certified manufacturers. Popolini believe responsible parents look for natural, practical and above all healthy products for their children. Sustainability is the key to a better future. Therefore they produce primarily in Europe and use only skin and environmental friendly materials. Their product development is guided by real needs of the parents. Many of their new products result from suggestions of mothers, midwives or thier own staff of which the majority has children themselves.